A journey headlong into the reality of the near future of mankind. The intelligent Universe out there never sleeps. Nor should you. Summary: A gripping drama and character study that takes science fiction themes and binds them together to form a fascinating and compelling plot that excites and entertains as it pilots the reader towards a thrilling climax. Emphasis on the strong female characters… take the lead in a genre which has traditionally been very testosterone driven…. the mission begins in earnest and things really escalate…. bringing things to a thrilling climax… a lively and compelling cast whose interactions are endlessly enjoyable, but then weaving in intricate ideas and themes. 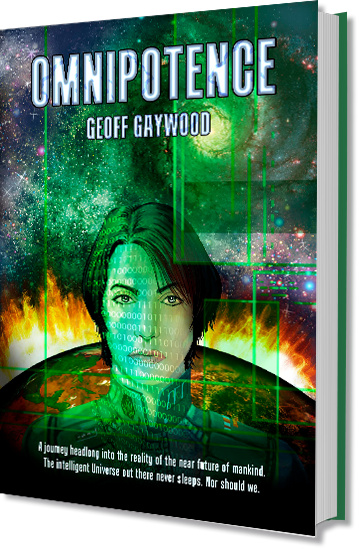 Paced well, intricately plotted and with a definite grasp of character voice, Geoff Gaywood has begun his Odyssey trilogy on an incredibly strong note. … a “page-turner” …intelligent and well-written science fiction…coherent and persuasive in its extrapolation of the future. … insightful on the future of our planet and convincing on the consequences of our short-sighted abuse of it. …knows his science . … seemingly impossible becomes surprisingly plausible. Summary: …a magnificent job at mixing credible scenarios of our possible future with knowledge of physics, technology, society, diversity and the essence of life. … a magnificent job at mixing credible scenarios of our possible future with knowledge of physics, technology, society, diversity and the essence of life. … the right amount of human needs in a witty way. …style is cult and direct and it makes reading easy. … fast paced story and really engaging …timely, given current concerns about global warming and political unrest. Great character development….Tension builds around the story’s main intrigue through giving us glimpses… liked the level of technical detail… the author has good underlying knowledge but doesn’t get too complex. Finally … giant marauding spiders! Really enjoyed. … could not put it down. The plot cracks along at a fast pace. Well thought out characters. Found myself rooting for some of them. Looking forward to next instalment. 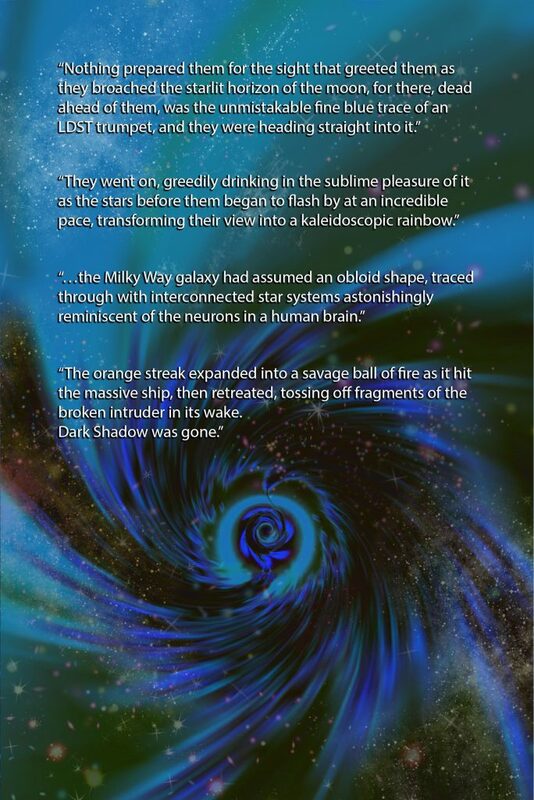 …an effective sci-fi story set early in the next century… world is chaos due to the impact of climate change. …an international effort to discover new worlds where humankind could make a fresh start….highly readable thriller describes the obstacles and dilemmas faced…on this critical mission. Good plotting- a real page-turner. Great holiday read. Some food for thought as well, given the current geo-political situation. I’ll definitely read the next one. Omnipotence belongs to the genre of futuristic realism, set in a context somewhere between possible and probable a hundred years from now. It is not fantasy. It makes plausible assumptions about technological progress and then invites the reader to participate in addressing the challenges that ensue. • What do you do when the viability of human civilisation on Earth can no longer be sustained? • How do you reach an alternative home for the human race given the distances involved and the limitations imposed by the speed of light? • How do you maintain mental health and social stability on such a venture? 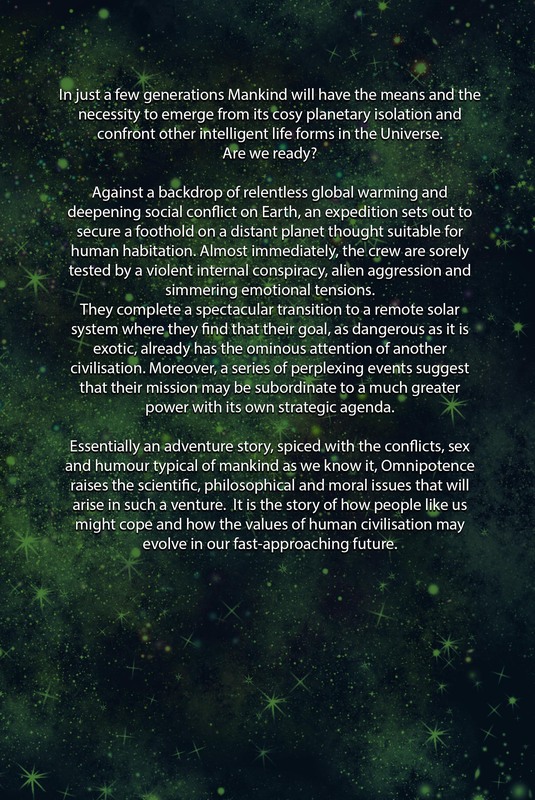 • How do you progress the colonisation of a new planet from initial settlement to viable economy? • How do you respond when you find your plans conflict with those of another civilisation? • Given the scale and complexity of the Universe, is it conceivable that our thoughts and actions could be influenced by some superior power with its own agenda? These are serious question that humanity will inevitably have to face as it emerges from its comfortable little solar system and begins to engage with the intelligent Universe beyond. Omnipotence is the story of how they might cope and how their perception of the purpose and value of human civilisation may evolve.